Charming example of a happy hare running right, faint lines to resemble fur. The odd condition of the patina leads me to believe that it once was silvered. 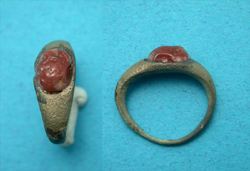 Worn by a Roman child or woman?